Round bag. 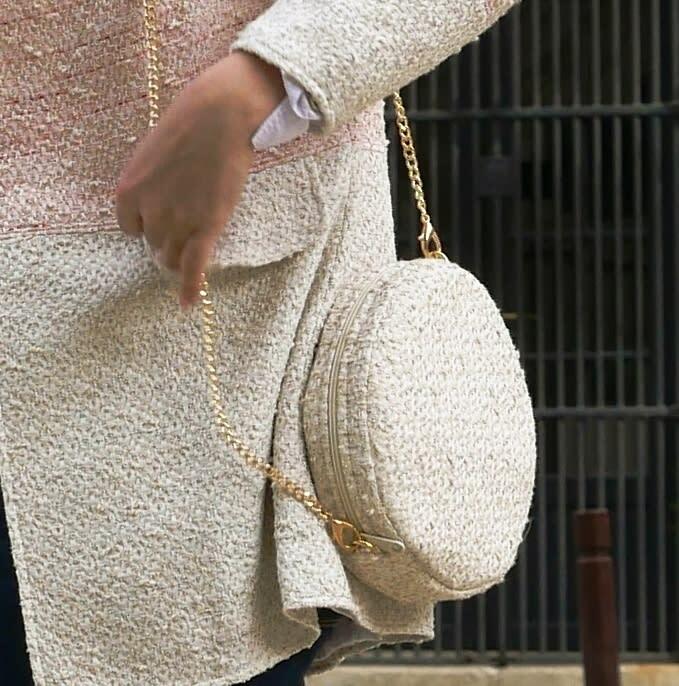 beige and white luxury tweed little shoulder bag. crossbody bag with removable strap or chain. round clutch bag with removable wrislet. Package shipping 48h. If you snap the thin wrislet hook you have a clutch. If you snap on the little golden rings, the hooks of the shoulder strap or the chain, you have a crossbody bag or a shoulder bag. Strap, chain and wrislet are with the bag. This feminin and delicate design offer you the possibility to take it for special event very chic (clutch) and for daily use (handbag). This little round bag also can go with a bigger bag (like tote) which carry your activity necessary to keep what is precious (identity cards, smart phone, money...). The choosen fabric is a designer beige tweed, very elegant and easy to match with. It's a modern and classic fashion accessory. This round purse is lined with off white cotton gabardine and closes with an assorted zipper. The rings and the snap hooks are in golden metal. Hand wash cold water, or dry clean.